The confluence of global climate change, growing levels of energy consumption and rapid urbanization has led the international policy community to regard urban responses to climate change as ‘an urgent agenda’ (World Bank 2010). The contribution of cities to rising levels of greenhouse gas emissions coupled with concerns about the vulnerability of urban places and communities to the impacts of climate change have led to a relatively recent and rapidly proliferating interest amongst both academic and policy communities in how cities might be able to respond to mitigation and adaptation. Attention has focused on the potential for municipal authorities to develop policy and plans that can address these twin issues, and the challenges of capacity, resource and politics that have been encountered. While this literature has captured some of the essential means through which the urban response to climate change is being forged, is that it has failed to take account of the multiple sites and spaces of climate change response that are emerging in cities ‘off-plan’. An Urban Politics of Climate Change provides the first account of urban responses to climate change that moves beyond the boundary of municipal institutions to critically examine the governing of climate change in the city as a matter of both public and private authority, and to engage with the ways in which this is bound up with the politics and practices of urban infrastructure. 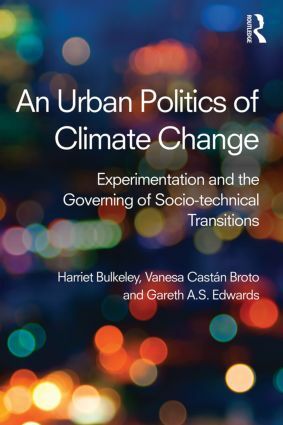 The book draws on cases from multiple cities in both developed and emerging economies to providing new insight into the potential and limitations of urban responses to climate change, as well as new conceptual direction for our understanding of the politics of environmental governance. Climateers – pioneering a new response to climate change in Hong Kong?